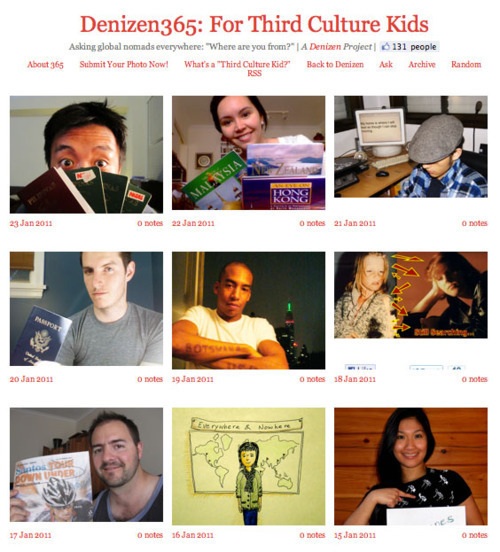 I recently launched a new project on Denizen, a magazine I founded for Third Culture Kids. Called ‘Denizen365,’ it is a photo project that captures 365 global nomad self-portraits over the course of a year. In each photograph, the participant is asked to visually answer the question, “Where are you from?” I wanted each person to struggle with how they defined “home,” and arrive at a conclusion that they thought represented who they were. Each person also had to submit a short profile — where they’ve lived, and what they thought about being a TCK. Through Denizen365, I hope to display the diversity and energy that Third Culture kids embody. I want the visitor to understand the patchwork identity defines the Third Culture Kid experience. You might see a photograph of someone who looks European, and then learn that they spent their entire life in Asia. Further investigating their profile allows you to hear them explain their TCK experience, as well as discover that they were also raised in Africa, or South America. With Third Culture Kids, you can’t make an assumption based on someone’s appearance. That’s what Denizen365 hopes to convey. We’re trying to get to 365 self-portraits. Please submit yours today.